Amora gem can be considered a new symbol of true love, which lasts forever. The new Eternity Amora Gem is now available in our eshop. A occasion requires a unique jewellery, that puts emphasis on detail and especially on Beauty and Brilliance of Amora gem. Amoras are each individually graded under the GIA diamond grading scale and priced according to their carat weight, color and clarity. The Universe has many secrets. We offer you the most brilliant. The Amora gem crystal naturally occurs around large stars as stardust, but has never been available on Earth until now. Words can´t describe how amazing the Amora gem is, just visit our section „About Amora“ to compare Amora with other common gems like diamonds, moissanite, sapphire etc. 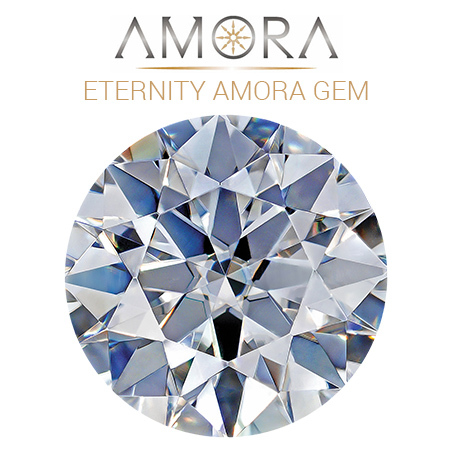 Due to its unique properties, the Amora gem has the potential to be the new „gem of love“ for all those, who don´t want to compromise and who are looking for something very special and exclusive. It is not a diamond alternative, but a quite new category in the luxury gems family. The Amora gem is a trendsetter and a trust builder. "I ordered a 3.03 carat round stone and had it set in a six prong platinum ring. I can't express how beautiful it is. Stunning! I also received some of the best customer service ever. Thank you so much!" We have created for you special jewellery collection bringing you the brightness gem in the Universe. With Eternity Amora gems and diamonds, the hardest minerals in the World. We are not following trends, We create them. Adon is the only brand in jewellery business, who offer the jewellery collection set up with Eternity Amora gem & brilliants. It´s not a diamond or moissanite. Very excited and super thrilled with my experience, I don't even know where to begin. As with other reviews, any and all of my correspondence was handled by Michal. Don't like the phone so I emailed numerous questions about the gems trying to find the perfect fit for me (my fiance). Michal was on top of everything! Replies were fast and friendly. A lot of the show gems online were larger than I actually wanted to get since my fiance has small fingers. He was super helpful and provided more information than I actually was expecting. I was up in the air between the Round and Cushion cuts and he actually pulled the physical stones I was inquiring about and made me a short live video comparing the two. I ended up choosing the 1.46ct Amora Round Hearts and Arrows cut. He never pushed for a larger sale, he was there for me and my wants/needs. Customer service was impeccable! Financial transaction was smooth and secure through PayPal, which eased my mind a bit for an international transaction. Cleared my account in about a day and even though they stated high demand and shipping could take up to 3 weeks, I received my stone in about 7 days via FedEx! Amazing!!! Now, the stone itself...Beyond my expectations! I was a little worried about it being so dazzling from the online videos that I was afraid it would look super fake in person and more like costume jewelry than a real diamond. Boy was I wrong. I cannot stress enough how much it is almost indistinguishable from a real diamond. I have done a ridiculous amount of research over the last several months and I have found out that most commercial diamonds are of relatively poor quality when it comes to the 4 C's scale, landing somewhere in the J-H Color, I-VS Clarity and Good - Very Good in Cut. Nowhere even close to the Color/Clarity/Cut of an Amora. My stone was an E Color, IF Clarity and Super Ideal Cut. Comparing a "Real" diamond with the same identifying factors would have cost me upwards of $28,000 for a 1.5ct at any of the big commercial stores. Yes, you can find cheaper if you skimp on color or clarity but apples to apples it was almost $30k! I checked! So back to my original statement about it looking fake, if you are like me and worried about this, don't be. In my research I looked at several "real" diamonds with the same or close to the same C's and to be honest they looked exactly like the Amora. 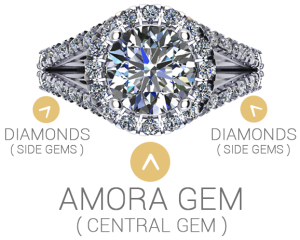 Diamonds that are that colorless and clear with the perfect cut have the same shine and brilliance as the Amora but only about 35x's more expensive! I was a skeptic and I went out on a limb with the Amora Gem only because they were so inexpensive and I could get a larger, better quality gem and I DO NOT regret it one bit. The Amora is 100x's more rare than diamonds and just as beautiful if not more stunning in person! I will probably never buy a "real" diamond ever again now that I know there are high quality, eco-friendly stones out there that emulate a diamond almost perfectly. I HIGHLY RECOMMEND LOOKING INTO AN AMORA!!! Just an FYI - I bought a 1.5ct (9 diamonds around) diamond band that I am having the Amora set into as the engagement ring and being just a regular guy, not a gemologist, you literally cannot tell which stones are diamonds and which is the Amora. They are identical in every visual way of color and sparkle.